Photos by Natasha Shapiro. Words by Arturo Conde. Brooklyn has long been a focal point for established and emerging graffiti artists competing for niche spaces in which to exhibit their artwork. At present, local residents appreciate a wide selection of street art that peers out from walls, billboards and abandoned commercial and industrial lots. Once deemed as a subversive act by many detractors, graffiti has evolved into a popular art form that’s gained wide recognition in international galleries and influenced marketing campaigns, graphic designers, and the fashion industry. And while London has replaced New York at the forefront of street art, Brooklyn has remained a fertile ground for experimental graffiti. A thriving arts community, and the availability of public spaces have attracted a diverse cluster of both talented local and international artists that continue to challenge perspective through different artistic mediums. 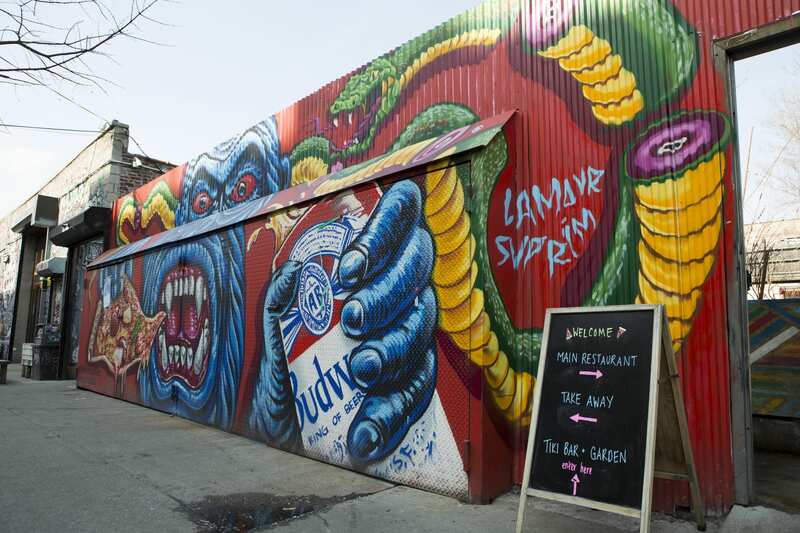 In recent years, graffiti in Bushwick has ranged from highly stylized texts and tags that are commonly associated with American graffiti, to more European-style street art, including poster-work, stencils and stickers. Considered to be the earliest forms of graffiti, these elaborate representations of the artist’s name vary in size, thickness and outline. The use of multiple colors, and the speed and precision that is required to write them, have elevated these trademark signatures to a universal form of self-expression. Painted by individual artists or collectives, murals can sometimes commemorate emblematic musicians, politicians and activists. With the influence of graffiti in advertising, some graffiti artists have also been contracted to paint murals for local businesses and corporations. Working from a print of one or more colors that are later sprayed-over, stencils allow graffiti artists to focus on cultural icons that can be reproduced with precision. Graffiti artists wheatpaste their poster-work on billboards and walls, sometimes actively incorporating their surroundings into the piece. How to get there: Take the L Train from Union Square to the Jefferson Ave stop. Then proceed on foot at your discretion with the self-guided tour of the featured graffiti sites. Editor’s Note: Our first version of this tour, published in 2008, can be found here. Start on Starr Street and Cyrpus Ave. Walk Southwest on Starr Street towards St. Nicholas Avenue. Turn right (West) on St. Nicholas Ave then make a left (Southwest) on Troutman Street. Turn right on Wyckoff (West) then make a left onto Flushing Avenue (Southwest). Shops at the Loom will be at the intersection of Thames Street and Flushing Avenue. Continue Southwest on Thames Street and turn right (North) onto Bogart Street, then make a left (West) onto Moore Street. Head West on Moore Street, turn right (North) on White Street. Continue on White Street to McKibbin Street, turn right on McKibbin (East). Continue East towards Bogart Street, turn left on Bogart Street, then make a right (East) on Ingraham Street. To get back to your starting point and The Bushwick Collective continue on Ingraham Street to Morgan Avenue. Turn right (South) on Morgan Avenue and continue to Flushing Avenue. Turn right and head Northeast on Flushing Avenue, turn right onto Irving Avenue, then left on Jefferson Street. Continue up Jefferson Street to St. Nicholas Avenue, and voila! You have returned to The Bushwick Collective! For more ways to experience Brooklyn, check out our guide to the boroughs best breweries, or an itinerary for a day in Red Hook.